Long wait, therefore, but LH’s 737-500 ‘Iserlohn’ pushed back only 2 minutes late at 0657 and despite various delays on the ground at BHX and MUC I was all done and dusted at MUC by 1005, just 10 late [and armed with toothpaste purchased airside at BHX!]. Off to M-Hbf on an aircon-less 425 (S8 at 1022) and arrived there with just over half an hour to spare before 1142 RB (111 042 leading) to Salzburg. I was even armed with an Augustiner Edelstoff, their premium pils. Alarmingly, this turned out to be 5.6% ABV. The RB left around 4 late and continued thus to Bad Endorf where it has a booked stop of 8 minutes. From there it maintained 1-2 minutes late all the way to Salzburg, where it arrived at one of the bay platforms at the western end. 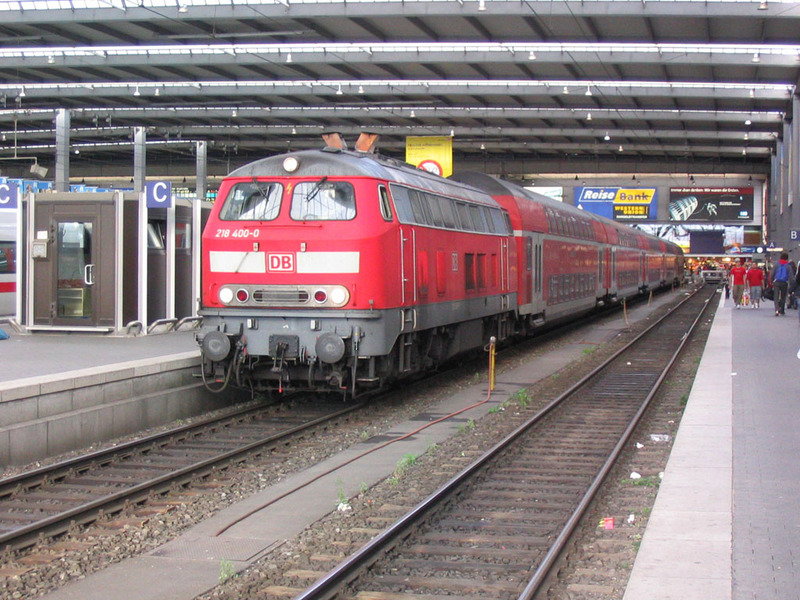 S-Hbf has one side platform and two islands, the first (from the north) of which has two bays at each end. The tap for one of the local breweries appears to be north-east of the station but there wasn’t time to get there – not to mention that having been up since 0300 I wanted to minimise beer consumption until (and when) I’d finished the day’s track! At which point it all went pear shaped, like it does. EC-whatever was 10 late, then 15, then 10, and finally appeared 17 late. Despite the 4 minute allowance it left 20 late, with no seats to be had, corridors jammed, air con failed. Just like home really, except that I got stuck in the vestibule of a smoker. Still, yer gotta do the track, so endured this to Kufstein – via the Rosenheim avoider which was the point of all this – where my connection back to Rosenheim was long gone. No sign of a pub nearby and it was bucketing down with rain, so nothing for it but to wait for the 1654 to Rosenheim. Thanks for that, ÖBB. They did partly redeem themselves with a spot-on 1654 back to Rosenheim, allowing me just to make 1730 to München Hbf (wedged again, but no air-con to fail and I managed to get a tip-up seat with a nice clear view of the track through the vestibule floor…) On time to München Hbf though, which was all that mattered. I’d planned for the 1845 RB to Ingolstadt, running just in front of ICE826 but on the yellow sheet I found the 1840 RE which was an altogether better prospect. Got my ticket for the ICE, grabbed some nosh and on to the 1840 which was fairly wedged but I did manage an aircraft seat to myself upstairs in the front coach, wherein I was able to celebrate with the morning’s other Augustiner Edelstoff. It’s going to have been a long, long day but hopefully worth it. OK so far – 3 late from Ingolstadt on the ICE with daylight fading. It’s only got to last as far as Feucht though. No worries! Weather cleared as we left Ingolstadt and the driver tried hard, stopping at Nürnberg Hbf with 20:28 still on the clock (20:28:50 in fact). It was still daylight when I got to Bar Füsser so obviously there was no problem with the NBS. Quite a lot of the NBS is underground, it being a fairly lumpy area, though not as much as some of the central NBS stretches. To be fair it does go under the Rhein/Donau watershed. Quite nice to look at on the above ground stretches too, though some of it has road beside it. Back at Bar Füsser, the large blonde was nice (!) but offhand waiter more interested in talking to his slimy little friend rather than serving his many customers rather spoiled it. I retired to the station where there was a nice air conditioned RE to wait on! Finally to Augsburg on the RE – I managed to stay awake as far as Donauwörth but faded out then and came to at Augsburg-Oberhausen. Arrival at Augsburg Hbf was 3 late, at 2331. Sense had prevailed a few days ago and I’d booked in at the ‘station’ Ibis which is only a couple of hundred metres away, if that. Woke at 0720, a bit of a disappointment with 55 minutes still to go on the alarm! It did however mean I could get 0903 Lindau as far as Buchloe instead of the planned 0937 with its 3 minute connection. An almost deserted pair of 642s contrasted with yesterday’s crowds. Marginally late at Buchloe but there was no connection to Kempten so I used the remaining 23 minutes to visit the local baker’s shop for a cup of coffee and a very nice turkey roll on which I broke lower left 6! Onward transport to Kempten was the planned Alex 1011 to Oberstdorf hauled by a disappointingly quiet ER20 003. Wretched partly refurbished, non air-con compartment stock. Rubbish. Odd timing at Kempten with Ulm – Lindau timed to arrive at 1055 just as Alex departs for Oberstdorf. They did, too. Perhaps they connect at Immenstadt [they do]. Alex used P2, as does our Oberstdorf train tomorrow so if all goes as booked I’ll have continuous track on at least one route (and both at Immenstadt). Train from Memmingen later on is booked into 2 as well. An HGK class 66 was noted in the oil (?) depot at Kempten. Connection is made at Immenstadt it seems. Alex was still there when we arrived, ER20 003 on one end and ER20 014 the other to take it to Oberstdorf. Tilting rubbish (612) was provided for Kempten – Hergatz. Good to know they have the same ‘tiolet’ problem as the Voyagers, if not worse. Mercifully it’s quite cool today, particularly at nearly 3000’, but my word, this particular unit really, really pongs. DE669, another HGK 66 was on tanks at Kisslegg. All fairly unexceptional Hergatz – Memmingen but pleasant enough. On time at Memmingen with sufficient margin to avail myself of the free facilities and grab a can of lunch (Paulaner Hefeweizen). Much difficulty writing these notes as I’m on no-tilting tilting plastic, 4½ late and seemingly intent on regaining it, which is just as well with a 7 minute connection at Kempten. Paulaner is trying to slide off the table and it’s a) open and b) nearly full, so time to attend to it! I had to do so in precipitate haste having let my mind wander on seeing the Alps in the far distance! Driver’s efforts, though admirable, weren’t all that successful and we rattled into Kempten P2 (as booked, so physical connections spot on) at 13:56:20. I was in my seat on the Rabbit-pushed, unbooked connection to München at 1358, just one minute to spare. Superb full-throttle departure by the Rabbit from Günzach. Worth every penny with the window open – hope there’s more! There were. The driver was clearly keen and a series of spectacular departures had us early at every intermediate stop. The train was just running in as I dashed to the subway at Kempten but I’m fairly sure there’s only one Rabbit. I’ll check at Pasing. Yes, just the one Rabbit, 218 469. It was late at Pasing due to several checks on the way in. Shame. It even obliged me by arriving in P3 at Pasing, whence the 1553 to Kochel is due to depart. And did, formed of a scabrous 425. On this I discovered the fascinating and arcane fact that the recess on the top of the litter bins is a perfect fit for an Augustiner Edelstoff bottle. How serendipitous is that. 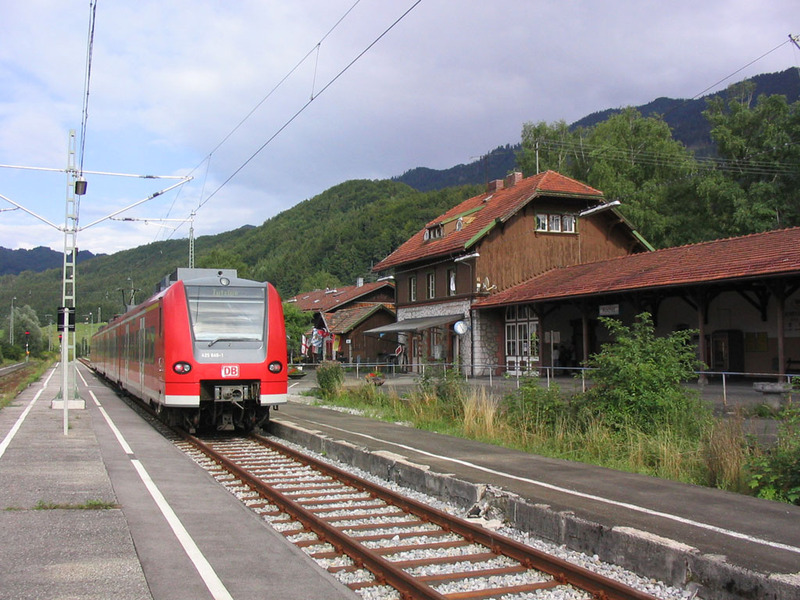 Physical connection [on to the Kochel branch] is a crossover just west of Tutzing – Garmisch and Kochel lines run as two parallel single lines for a mile or so after that (as indeed S&W indicates). Grippage is red-hot on this service – two of them, right on the case. I have to note that the clientele seems remarkably un-villainous and nobody’s been nailed within my vicinity! 1800 to München Hbf (electric loco shoved, ex Mittenwald which begs one or two questions about Garmisch on Wednesday) [I’m sure I knew what I meant at the time, but I don’t now!] appeared on time and as I write it’s making its way through the rain on to the ‘fast’ (coming out they were very, very slow) lines at Starnberg (no, I’m lying – they don’t start for another 9 km, at Gauting). Going in, the fast lines were fast. Changed at Pasing for the S8 out to Unterföhring where there was time to check into the Comfort Hotel (all of 3 minutes walk). Then on to the airport to meet H, whose 2010 arrival landed at 2005. It took another 20 minutes or so before she appeared having collected baggage, but I was able to occupy some of the time in purchasing Mittenwald (Gr) to Scharnitz returns for Wednesday. Dinner was taken at Airbräu, and jolly good it was too, with a Wiener schnitzel, a pork steak and rice, and two beers weighing in at €21. One of the few dead end branches on this trip was the Tutzing-Kochel line. 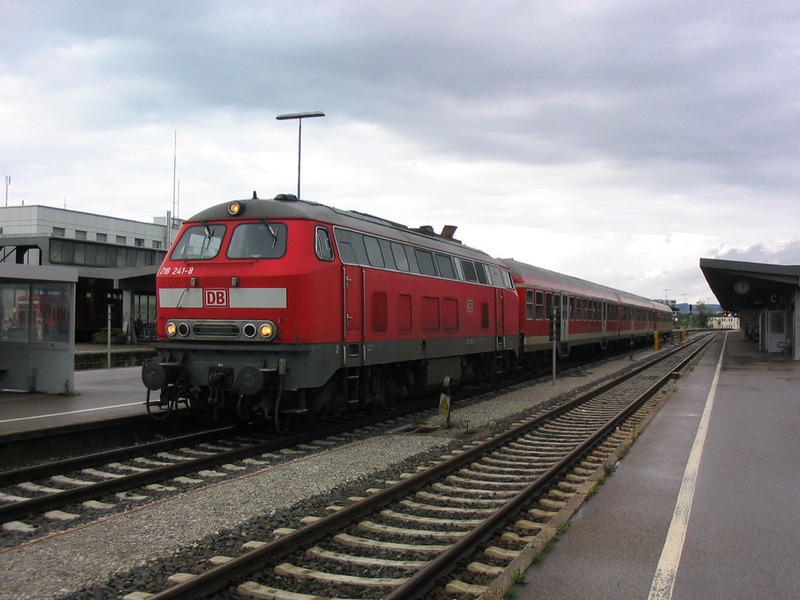 Here 425 649 stands at Kochel about to form RB30428, 1703 to Tutzing on 21.8.06. The end of the line is behind me. Foul morning with intermittent heavy rain, just the job for the mountains. Let’s hope it improves. Standard breakfast with English option and some fruit salad, all very reasonable at €55 for double room with breakast. It stopped raining for just long enough to get to the station for 0900 S8 into town. 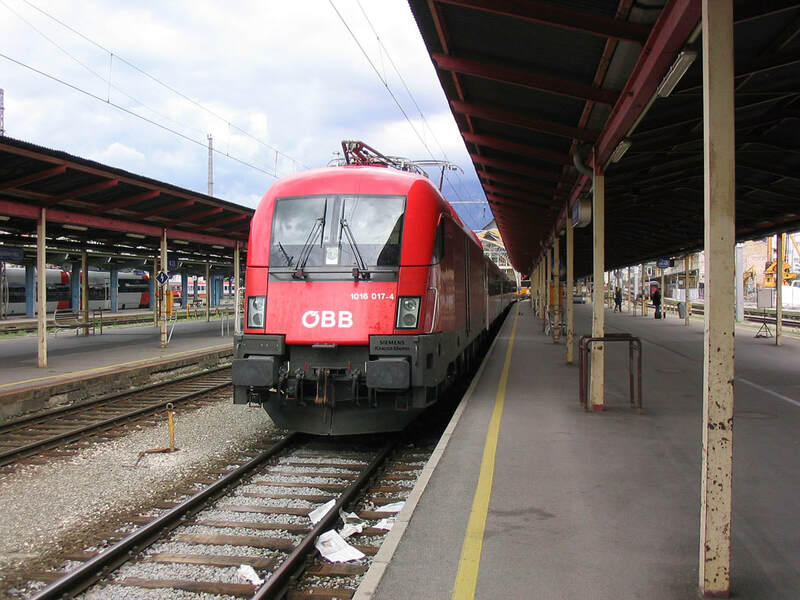 Tried changing our HRS bookings on arrival at M-Hbf – general all round failure resulting in my credit card details being left visible on a public computer! Mad dash to get 0951 to Buchloe, followed by a quick call to NatWest to cancel my card just to be on the safe side. Nothing was amiss and all pending transactions had gone through, so no problem. [Neither my address nor PIN number nor any other security type info had been on display but a bit of paranoia seemed more sensible than leaving it to chance. NW seemed to agree and dealt with it all very efficiently.] On to Buchloe with 218 223 which managed to retrieve its 2 minutes lateness en route. 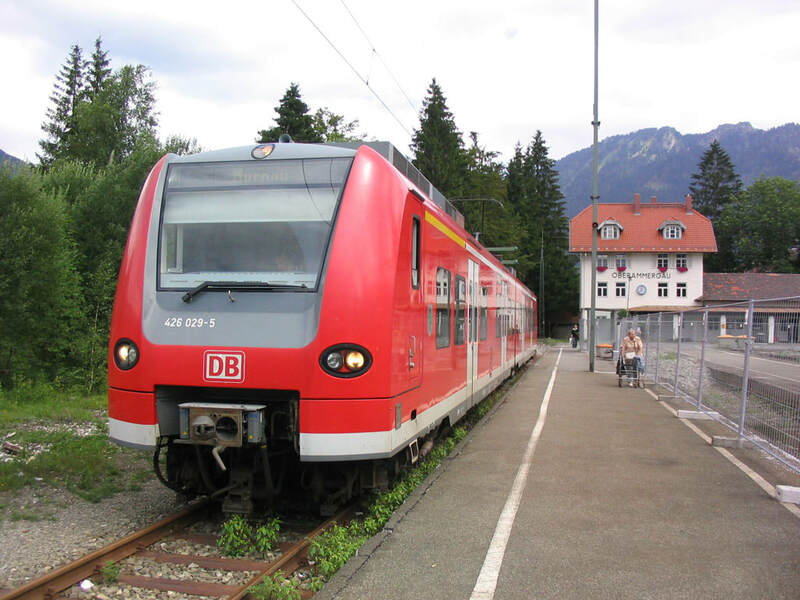 Füssen train at 1044 was a pair of 628s in contrast to yesterday’s 0944 which was a Rabbit. As was today’s 1144 which we passed on the way down. Füssen was pretty disappointing with low cloud and rain most of the way, Alps nowhere to be seen. The upper part of the line is steep in places and sharply curved – lower down it’s pretty dull. 5 late at Füssen so no time for anything but a token phot.We went through to Kaufbeuren to reduce hanging around in the rain time; it has a station buff but with only 10 minutes it had to remain unvisited. From Kaufbeuren to Immenstadt on a Lindau train with more splendid thrash from Rabbit 218 314. Better yet, the front compartment was empty so the window was duly opened! At Immenstadt wretched non-tilting plastic was waiting to go to Oberstdorf. Sadly the cloud and rain did their best to obscure this line, surrounded by fairly serious Alplets and probably very fine on a clear day. Like yesterday. Humbug. True to type the plastic garbage expired as we arrived at Fischen – but seemingly only the rear set, or even just the rear car, and we limped on to Oberstdorf, arriving 5 minutes or so late. Oberstdorf boasts a fairly glum four-ale bar within the station buildings – at €5 for 0.83 (05 + 0.33) litres of the Dampfbrauerei’s unfiltered Hell, it’s pretty expensive too. Across the road is the brewery tap, equally expensive but far more congenial. In the interests of objectivity it seemed proper to sample both. The beer could reasonably be described as excellent. Back to Immenstadt and Kempten with Alex. ALXs are top and tailed on the branch, the loco at the Oberstdorf end being attached at Immenstadt. It seems strange that keeping a loco permanently allocated to the branch is cheaper than running round at Immenstadt. Locos this time were ER20 011 (downhill end) and 006 (Oberstdorf/uphill end). Straight through to Kempten this time, with connection OK, then on a 642 to Reutte in Tirol. The gloom had lifted enough by now to be able to see a little of the mountains, so not a complete washout. The Hotel Café Das Beck is right in the centre of town, easy to find. Food was more difficult to find (amazing in a tourist area) but we eventually got a very decent meal in an Austrian/Italian restaurant (Grillteller in my case) accompanied by Kaiser pilsener which I quite liked. 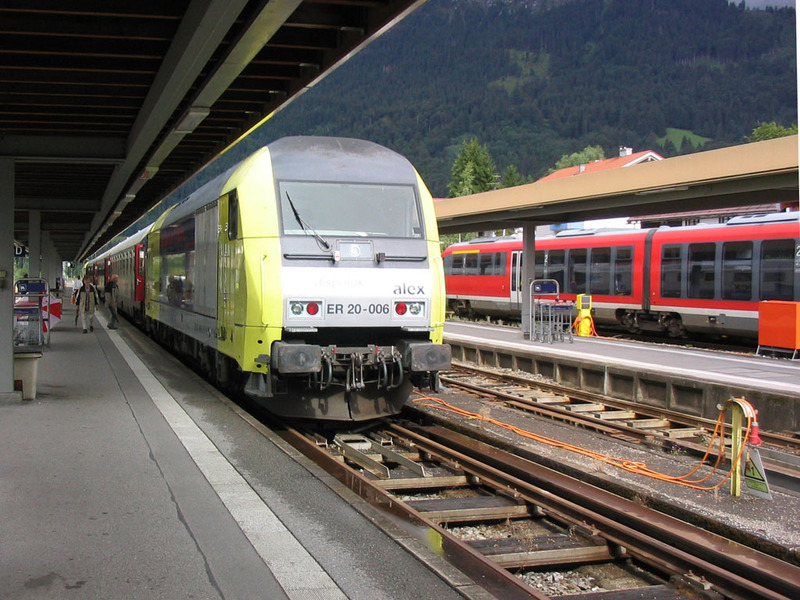 ALEX's ER20-006 stands at Oberstdorf at the rear of ALX86713, 1606 to München on 22.8.06. Back at Kempten, 218 241 has arrived with RE32776, 1706 to Lindau. Good breakfast at Das Beck. Not the cheapest place I’ve stayed, but recommendable nonetheless. Off to the station for the 0903 to Garmisch, a 425 which went from a different platform, alas. Got the overlap at least! Fantastic scenery all the way to Garmisch, helped by a sunny morning. Quick change to a 111-hauled Innsbruck train out to Scharnitz where there’s a station gaststätte dispensing coffee and (Puritans look away now – it was 1025) Gässer. More superb scenery and an altogether excellent jaunt. Back through Garmisch on an Innsbruck – München as far as Murnau where, alas, all Oberammergau trains a) are 426s b) go from 1a, the bay platform. We then did my last German branch, to Oberammergau, and wandered up to the town (mega tourist trap, not really to my taste) for lunch. The branch is excellent, seems to make its way somehow from Isar to Ammer valley and is very ‘windowgenic’. The station area at Oberammergau is notably tatty and only one platform remains with (at least) two lifted. Lunch was from the ‘American week’ menu but not bad for all that, and accompanied by acceptable Paulaner pilsener. Back on the 1440 to Murnau Ort whence we walked up to the town (nice bustling market town) in search of the Griesbräu home brew pub. Due to me getting my Obers and Unters mixed up we ended up at the Karg brewery tap (27 Untermarkt not 37 Obermarkt!). Very acceptable weizen (possibly their only product?) whose only fault was being ruinously expensive. This diversion aside we joined the next 426 to Murnau ‘Hbf’ and then a late running 111-shoved RB to Weilheim (my very last DB regular passenger track, after very nearly 14 years) and straight on to München Hbf. Far more of a whimper than a bang, being distinguished only by seeing some sheep, quite unusual in these parts. The completion of my epic voyage was celebrated with a bottle of Münchener Pils (Hacker-Pschorr) from the bothy at Murnau! Into München Hbf and then to Hotel Dolomit where they’d never heard of us, which was exactly what I wanted after Tuesday morning’s Internet fiasco! It left us needing somewhere to stay – Dolomit was full which was a blessing in disguise because after a few minutes wandering we hit upon the Munich Inn at Goethestr. 15. This was pretty dour downstairs but in fact provided us with a very smart room in ‘as new’ condition for the same €70 as Schongau, which I’d cancelled this morning from an Internet café in Reutte. Saved us tomorrow’s Bayernticket too, and leaves us in town ready for H to go to the Alte Pinatothek tomorrow. The Alte Pinatothek [a major art gallery which we’d missed on a previous visit due to my failing to grasp the idea of it being closed on Mondays] was suitably rewarding for H with four Rembrandts (her idol) and a Leonardo amongst many others. Oh, and two tram rides for me! Out to the airport where Lufthansa’s wonderful automated check-in failed on H’s suitcase, but no other problems until the weather intervened with hail and thunder. This made us about 40 minutes late at BHX (due 1620) but we made the 1720 CT to BNS in reasonable comfort. Usual evening farce was in progress at BNS with the 1757 Salop a) late b) heaving and c) given a platform change at – you guessed it – 1757. Some standard CT commuter tactics got H and me a seat on the 2-car 170 which despite being Parliamentary from Wolves (and stopping at Coseley) had standing passengers all the way to Telford where our son collected us. The end of the Great German Grice seemed all a bit low key. But despite never managing to grasp the language I’ve come to love going there, the civilised and orderly way in which they seem to do things, the wonderful variety of pubs and beers, particularly in the south, the scenery, again particularly further south, and a host of other things. I was treated with almost unfailing politeness and helpfulness by Germans of all sorts and ages, so much so that you’ll find it recorded in my notes every time anybody wasn’t polite or helpful – and that’s only because it’s so very unusual. Luckily for me, there are still a large number of preserved lines and odds and ends like ‘Summer Sunday only’ services to do, and that’s before you get round to engineering diversions, railtours, and even better, new lines and reopenings. So I’m sure I’ll have plenty of excuses to keep revisiting! In any case, this isn’t the end of the Eurogricing story. I’m still working away at the Czech Republic, with Slovakia, Austria and Switzerland waiting in the wings.